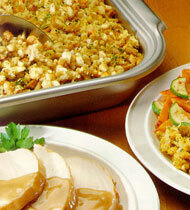 Stuffing: its not just a good side dish during Thanksgiving. This 6-ingredient recipe will allow you to simply and easily exceed your patron's expectations. 1. Combine stuffing seasoning packet, butter and water in saucepot. Heat to a boil. Remove from heat. 2. Add stuffing, apricots, raisins and almonds. Place mixture in greased full hotel pan (20x12x2). 3. Bake at 350º F. for 25 minutes or until hot. CCP: Bake until internal temperature is 165º F. or higher for 15 seconds.